Following Ganfeng’s investment, Lithium Americas is optimistic about remaining fully funded to advance Caucharí-Olaroz to production. Shares of Lithium Americas (NYSE:LAC,TSX:LAC) jumped more than 10 percent after it announced a US$160 million investment from Chinese company Ganfeng Lithium (OTC Pink:GNENF). The Asian top lithium producer will increase its current 37.5 percent interest to 50 percent, forming a 50/50 joint venture with Lithium Americas to develop the Caucharí-Olaroz project in Argentina. Following the investment boost by Ganfeng, Lithium Americas is optimistic about remaining fully funded to advance the project to production under the current 25,000 tonne per annum (tpa) lithium carbonate development plan. “The new US$160 million investment by our partner Ganfeng significantly de-risks Caucharí-Olaroz by providing additional assurances that the company remains fully-funded for the current 25,000 tpa development plan and supports the evaluation of an increase in initial production capacity to 40,000 tpa of lithium carbonate,” commented Tom Hodgson, Lithium Americas’ CEO, and Jon Evans, the company’s president and COO. In fact, the companies are currently working on a feasibility study to increase initial production capacity from 25,000 tpa to 40,000 tpa of lithium carbonate. Additionally, permitting and development work is being done prior to an expansion decision. At the same time, construction activities at the project remain on track, with first production expected in the second half of 2020. “Ganfeng Lithium will play a key role in the process definition, engineering and commissioning of the lithium chemical plant leveraging their track record as the world leader in the production of high-quality lithium compounds for electric vehicle and battery customers,” said Gabriel Rubacha, president of South American operations. Lithium is a key element in electric car batteries, with demand from the metal expected to increase in the coming years. Lithium Americas also released an updated measured and indicated resource estimate for Caucharí-Olaroz of 17.9 million tonnes of lithium carbonate equivalent (LCE), representing a 53 percent increase in LCE from the previous resource of 11.9 million tonnes, all at a cut off of 300 parts per million lithium. Aside from Caucharí-Olaroz, Lithium Americas owns 100 percent of the Thacker Pass lithium project located in Nevada, the largest known lithium deposit in the US. 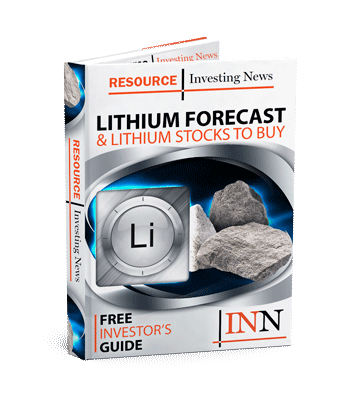 Shares of Lithium Americas were up 3.8 percent on Tuesday (April 2), closing at US$4.37. The company’s share price is up 16.67 percent year-to-date.